The phrase “easy as pie” sometimes bothers me. I don’t think pie is super difficult to prepare. It does take some time, however, to make, chill, and roll out a pie crust. So I don’t think pie should be the standard for ease. And I do love ease. As readers who follow other my blog, Pulling Taffy, know, most of my time these days is taken up with care for my elderly mother, who suffers from dementia. One of Taffy’s quirks at this point in her life is that she really HATES to be alone, even for a few minutes. So my dinner-prep time is limited. This chicken casserole suits me perfectly. I can chop the onion while chatting with her. The only time I have to be in the kitchen is the five minutes or so it takes to brown the chicken, a task I try to accomplish while my mother naps. The recipe was suggested by a vendor I met at the farmer’s market near mein Alexandria, Virginia, last week. Lily Castaño is the creator of Salsa Las Glorias, a range of salsas that are in indeed glorious. I bought way too many of them! Perhaps I should feel guilty about cooking with a pre-made product. 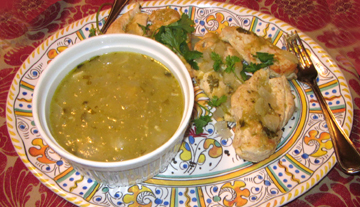 When tomatillos come into season, I can always make my own salsa verde as I did in a previous recipe for Salsa Verde Pie. Meanwhile, Lily’s super-fresh salsa is a far cry from a can of soup. And her chicken idea (roughly translated by me) is delicately flavored yet satisfying. The sour cream adds just a little extra smoothness. The dish is highly flexible. Use leftover chicken if you like, and/or make it with unboned unskinned chicken for extra moisture. (Just make sure you cook the chicken through!) I seem to remember Lily sometimes used herbes de Provence; I might try a little cumin next time. And when I heated up leftovers the other day I threw in some ripe olives, which added color (yes, black is a color!) and flavor. Please note that although this recipe served my mother and me plus our dog you may want to add more chicken. Only you know whether your family members routinely eat a whole or a half chicken breast for dinner. Slice the chicken breast in half along the vertical edge so that you have two thin cutlets with the same shape as the original breast. In a medium pan over a medium-high flame heat the oil until it shimmers. Brown the cutlets briefly on both sides, adding a light amount of salt and pepper. Transfer the cutlets to a baking dish. 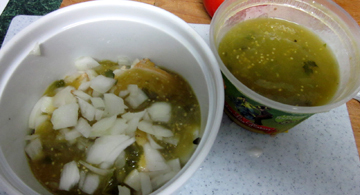 Cover with the salsa and then the onion pieces. Cover the baking dish and bake for 45 minutes. Serve over rice and garnish with sour cream. My friend Peter from New York and Massachusetts came to visit my mother and me in Virginia this week. His dogs Lucca and Marco enjoyed a joyous reunion with my own Truffle. We wanted to celebrate the visit—and to mark Peter’s birthday, which took place last week. We tried barbecue from not one but two different local venues here in Fairfax County. 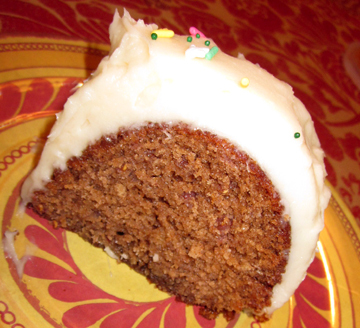 It left a sweet and tangy taste in our mouths, the perfect preview for the cake I whipped up for the occasion. Peter is NOT a standard birthday-cake boy. He eschews your basic chocolate and yellow cakes. 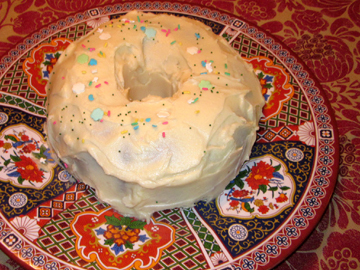 In the past, I have made him other recipes on this blog, including Teri’s Pumpkin Cake (probably his all-time favorite in my repertoire) and Rhubarb Baked Alaska. So I thought this spicy jam cake would suite him well—and it did. The spices predominate. The jam barely makes a statement, but it does keep the cake moist. I adapted the recipe from the Treasury of Tennessee Treats, an elderly but useful community cookbook sent to me recently by my friend Kelly Boyd, a native of Athens, Tennessee. Preheat the oven to 375 degrees. Grease and flour a 10-inch Bundt pan. Cream together the butter and sugar. Beat in the eggs, one at a time, followed by the spices and dissolved baking soda. Stir in the flour, followed by the jam. Pour the batter into the prepared pan (the batter will be a rather sad-looking color—sort of a grayish mud–but it will turn a lovely brown in the oven) and bake until a toothpick inserted into the center comes out clean. In my so-so electric oven this took 30 to 35 minutes. Let the cake cool in its pan on a rack for 10 minutes; then invert and remove it and let it finish cooling. Ice with cream-cheese frosting.